This windlass mechanism is a mechanical model that describes the manner which plantar fascia supports the foot during weight-bearing activities and provides information regarding the biomechanical stresses placed on plantar fascia. 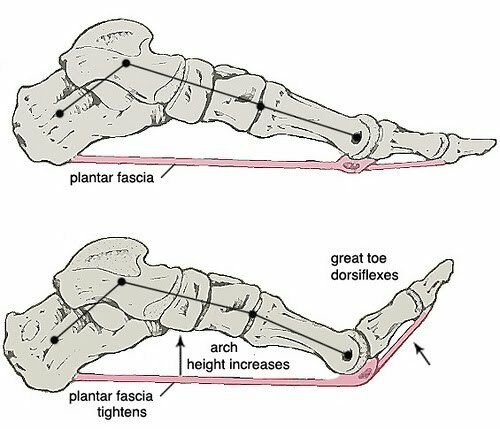 The windlass test achieves a direct stretch on the plantar aponeurosis which can be effective in examining dysfunction of the plantar fascia. The test can be important in the decision-making process involved in the evaluation and treatment of plantar fasciitis. Hicks originally described the foot and its ligaments as an arch-like triangular structure or truss. The calcaneus, midtarsal joint, and metatarsals (the medial longitudinal arch) formed the truss's arch. The plantar fascia formed the tie-rod that ran from the calcaneus to the phalanges. Vertical forces from body weight travel downward via the tibia and tend to flatten the medial longitudinal arch. Furthermore, ground reaction forces travel upward on the calcaneus and the metatarsal heads, which can further attenuate the flattening effect because these forces fall both posterior and anterior to the tibia. The plantar aponeurosis originates from the base of the calcaneus and extends distally to the phalanges. Stretch tension from the plantar fascia prevents the spreading of the calcaneus and the metatarsals and maintains the medial longitudinal arch. The plantar fascia prevents foot collapse by virtue of its anatomical orientation and tensile strength. A “windlass” is the tightening of a rope or cable. The plantar fascia simulates a cable attached to the calcaneus and the metatarsophalangeal joints. Dorsiflexion during the propulsive phase of gait winds the plantar fascia around the head of the metatarsal. This winding of the plantar fascia shortens the distance between the calcaneus and metatarsals to elevate the medial longitudinal arch. The plantar fascia shortening that results from hallux dorsiflexion is the essence of the windlass mechanism principle. A positive windlass test: heel pain reproduced with passive dorsiflexion of the toes. The difference between bearing weight and non-weight is that the sensitivity is higher in weightbearing De Garceau et al. showed 100% specificity for weightbearing and sensitivity of 32 % for non-weight bearing tests. Passively raise the toes of the patient while he/she is sitting to see whether this causes pain. The patient stands on a step stool and positions the metatarsal of heads of the foot to be tested just over the edge of the step. The subject is instructed to place equal weight on both feet. The examiner then passively extends the first metatarsophalangeal joint while allowing the interphalangeal joint to flex. Passive extension (ie, dorsiflexion) of the first metatarsophalangeal joint is continued to its end of range or until the patient’s pain is reproduced. ↑ 1.0 1.1 Bolgla LA, Malone TR. Plantar fasciitis and the windlass mechanism: a biomechanical link to clinical practice. Journal of athletic training. 2004 Jan 1;39(1):77. ↑ Cole C. et al. ,Plantar fasciitis: evidence-based review of diagnosis and therapy, Am Fam Physican, 2005;73(11);2237-2242,2247-2248. ↑ 5.0 5.1 5.2 MC Poil T.G., Clincal Guidelines, Heel- Pain, Plantar Fasciitis, journal of orthopaedic and sports physical therapy, 2008, A1-A19. ↑ 6.0 6.1 6.2 De Garceau D, Dean D, Requejo SM, Thordarson DB. The association between diagnosis of plantar fasciitis and Windlass test results. Foot Ankle Int.2003;24:251-255. ↑ Wong M., Pocket Orthopaedics: Evidence-Based Survival Guide(2010),Mississauga, Jones and Barlett Publishers, (p. 361).